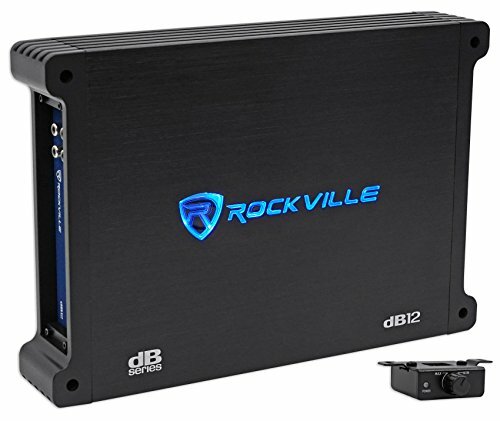 The dB12 is a class D monoblock high power amplifier with 2,000 watts peak output, 1,000 watts RMS output, and 500 watts CEA-2006 rated power. All of the mono amplifiers in the dB series are 2 ohm stable. They are all CEA-2006 compliant, which makes it easy to compare this amplifier to other CEA compliant amps on the market. Here at Rockville we offer the best value in car audio. We therefore want to make it easy for you to compare our products to any brands on the market. So we provided 3 ratings for all of our car amplifiers. We provided a CEA compliant rating, which you should use to compare this amplifier to other premium brands that make CEA compliant products such as Kicker, Rockford Fosgate, Kenwood, Pioneer, etc. We also supplied an RMS rating that is not CEA compliant, but has become standard in the industry. You should use this rating when comparing with ratings from brands such as Hifonics, Earthquake, DB Drive, etc. Lastly, we also supply a peak rating which almost all brands in the industry provide. This peak power is the amount of power the amp puts out at the loudest moments during a particular song. One of the tricks to determine the real power of a car amplifier is to multiply the fuse rating by 10 to determine the true RMS power. This formula almost always works within 20 %. The dB12 features a Maxi fuse with a rating of 60 Amps. Although we rate these conservatively at 500 watts CEA @ 2 ohms, this amplifier puts out more power than this! This amp has a fully adjustable 12dB/Octave crossover with differential circuitry. Other features include a subsonic filter, a fully adjustable bass equalizer, mute and delay soft start technology, a phase control switch, and a dashboard subwoofer control for added convenience. The dB12 is protected by a full IC controlled circuit and has professional peak limiter circuitry guaranteeing distortion free music playback at all levels. RMS Power Ratings: (Use these RMS ratings when comparing with great brands such as Hifonics, Earthquake, Soundstream, etc.) : - 2 Ohm: 1000 Watts x 1 Channel. - 4 Ohm: 600 Watts x 1 Channel. Peak: (The amount of power the amplifier can produce for a split second at the loudest part of a song): - 2 Ohm: 2000 Watts x 1 Channel. - 4 Ohm: 1200 Watts x 1 Channel. High-Speed MOSFET Power Supply. Designed, Engineered, Developed, and Quality Controlled in the USA. Fully Adjustable 12dB / Octave Crossover with Differential Circuitry. Low Pass Filter: 50Hz - 250Hz. Subsonic Filter: 15Hz - 55Hz. Phase Control Switch 0-180 degrees. Full IC-Controlled Protection Circuitry. Remote Dashboard Subwoofer Control. Fully Adjustable 12dB Bass Equalizer. Mute and Delay Soft Start System. RCA Preamp Line Output. RCA Line Input (This is to connect the amplifier to your receiver). Molded power terminals have the highest current draw in the industry and they also look way nicer than other terminal styles. 8 Volt Preamp Circuitry. Power and Protection LED Indicator. LED Illuminated Logo. Minimum THD at Rated Power: <0.1%. S / N Ratio: >90dB. Under Voltage Protection at 10V. Over Voltage Protection at 16V. Frequency Response: 15Hz - 250Hz. Damping Factor: >150 @ 100Hz. 60 Amp Maxi Fuse. Dimensions: (W x H x L) 9" x 2.4" x 13.1".